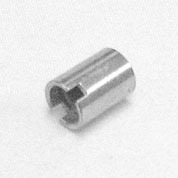 Threaded sleeve nut that mounts on inside of main cabinet wall and acts as a pivot or slide pin for the playfield. Attaches to cabinet carriage bolt that installs from outside of cabinet (not included). Has 3/8 x 16 internal thread. Used on some earlier Bally & Williams games from mid/late 1980s and up. Commonly worn out or missing in many games. Later-model games with slide-out rails will use longer 7/8-inch nut (02-4329-1) and many earlier games will use a 11/16-inch nut (part # 02-4329-2).